LOSS ON HEATING OF BITUMINOUS MATERIALS. The loss in weight (exclusive of water) of bituminous materials when heated is called loss on heating of bituminous materials. 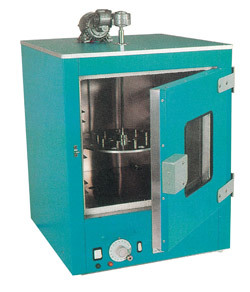 To determine the loss on heating of bituminous materials. a) Oven – heating capacity is minimum 1800C and interior dimensions min.330X330mm. b) Aluminum Rotating shelf - the self shall be suspended by vertical shaft and centered with respect to the horizontal interior dimensions minimum diameter of 250mm, and shall be provided with a mechanical means of rotating it at the rate of 5 to 6 rpm. c) Thermometer – 0 to 3600C – sensitivity 0.10C. d) Containers- Metal or glass cylindrical containers shall have a flat bottom and diameter 55mm, 35mm depth minimum. e) Balance – sensitivity 0.01gm. Heat the sample with care, stirring constantly to prevent local overheating, until the sample has become sufficiently fluid to pour. Place the sample in container and cool the sample to room temperature and then weigh to the nearest 0.01gm. Bring the oven to a temperature of 1630C and place the container in oven for period of 5 hr. Remove the sample from the oven, cool to room temperature, and weigh to the nearest 0.01gm. And calculate the loss due to heating. Limits: Loss on heating of all grades, except A200 & S200 of bitumen is maximum 1% by mass. Loss on heating of grade A200 & S200 is maximum 2% by mass.